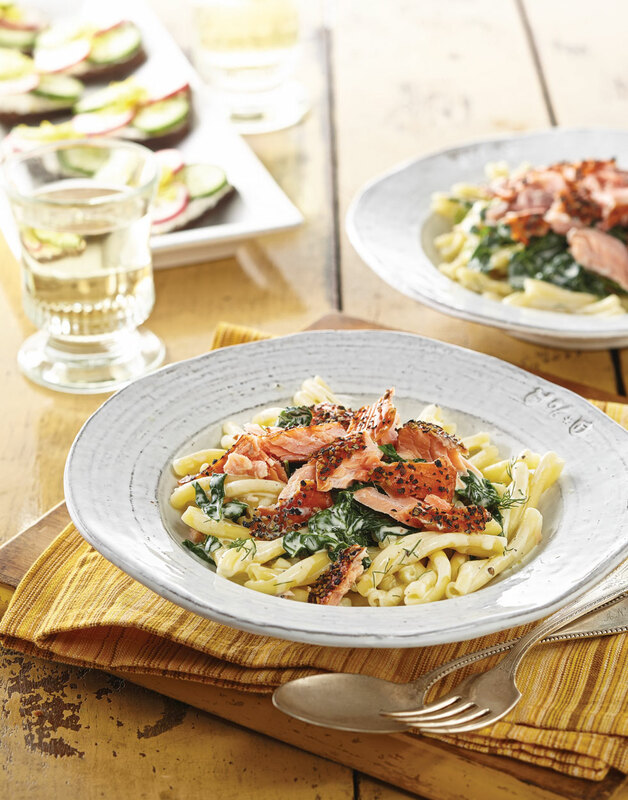 Convenient, ready-to-eat smoked salmon tossed with a spinach sauce and pasta put this rich and creamy dinner on the table in the time it takes to boil the casarecci pasta. Cook pasta in a pot of boiling salted water according to package directions; drain. Heat cream in a skillet over medium until it steams and bubbles appear around the edges, about 10 minutes. Stir in spinach, dill, and pasta, tossing until spinach wilts; season with salt and pepper. Serve pasta topped with salmon. Casarecci [KA-sey-RE-tchee] is a rustic rolled tube of pasta and adds a toothsome texture. It might look like you’re adding a lot of spinach, but it cooks down very quickly, so be sure to use all of it. Remove the tough skin underneath the salmon, then to easily flake it, use two forks to break it apart.